We are very excited that next week we will be exhibiting at the trade fair SARCDA in Johannesburg for the first time! 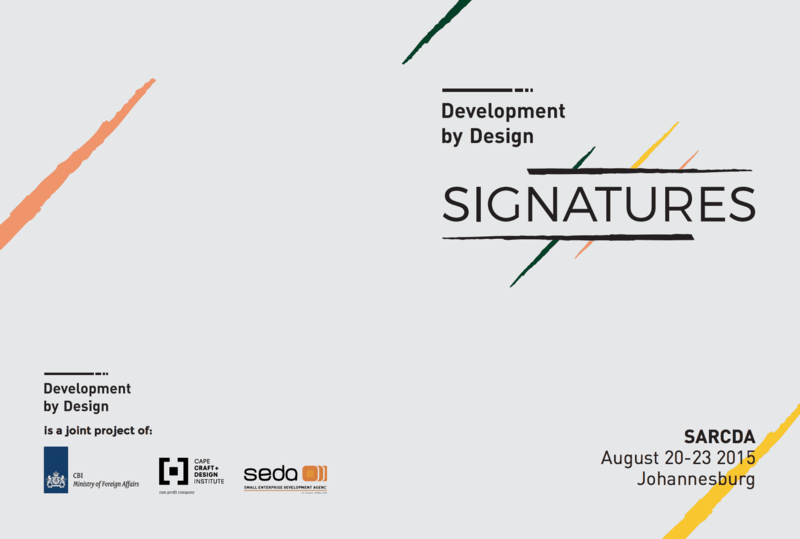 August 20-23, Development by Design, a joint project by CBI, CCDI and SEDA, is presenting the exhibition SIGNATURES! We will be showcasing our paper sleeve range and launching a BRAND NEW digitally printed range! Find us in Hall 3 Stand 28-33 and 37-44. SIGNATURES (the name given to the exhibition) brings together the best in South African product design in this curated selection of craft and design products that stand out because of their originality, pattern and use of colour. Skilled artisans have made use of interesting techniques and quality local materials, providing meaningful work and income for local communities. The ´Development by Design´ project enables small and medium businesses in South Africa to develop and grow. Nearly 30 entrepreneurs are participating in this project, taking their design studio, workshop or manufacturing company to the next level, and onwards to the export market. The project is an initiative of The Dutch Centre for the Promotion of Imports from Developing Countries (CBI), and their local partners, the CCDI and SEDA. Together, these business support organisations promote South African entrepreneurs at both local and international trade fairs. SARCDA from 20 – 23 August 2015 at Gallagher Convention Centre, Johannesburg, brings together verified retail buyers with South African and international wholesalers, importers, exporters and manufacturers. The highly successful and anticipated SARCDA showcases the latest in gift, design and décor trends. This entry was posted in Blog and tagged CBI, development by design, exhibition, paper sleeves, sarcda, sarcda 2015, seda, signatures, the wren design, Wren.